Senses are important in the Bible. For example we use our mouths and noses to take the world into ourselves. The life of the world (food and air) becomes our life as we eat and breathe it into our bodies. Sexual union is also a kind of ritual eating as two become one. Taste and smell are inextricably linked as you will know from the last time you had a cold. You can't taste anything and it is infuriating. To smell something is to receive it and to take it into yourself. The Angel of the LORD, the pre-incarnate Christ, the one who represented the Father to Israel, who dwelt enthroned above the ark of the covenant in the glory cloud over the tabernacle (and later the temple) would literally smell the aroma of the tens if not hundred of meat, grain and drink sacrifices being offered on any given day, a few metres away from him. 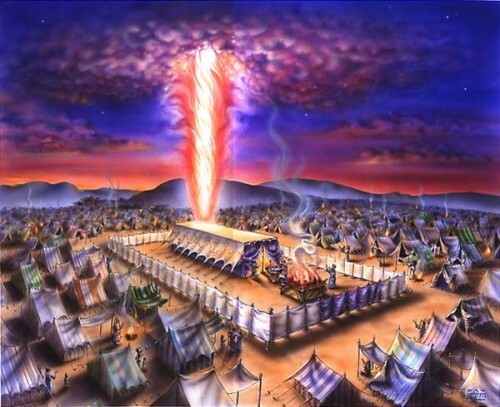 The aromas of sacrifice rise up to the LORD enthroned in the cloud above the Ark of the Covenant. In receiving the aroma into himself he, the LORD, would remember his covenant, his anger at human rebellion would subside and he would again fellowship with his people. Not that these animal and grain sacrifices did away with sin, but in smelling them, the LORD would be reminded of the day when he himself would come down from his throne, take the place of both priest and sacrifice and give himself as a pleasing offering to the Father, uniting Heaven and earth for ever.